Non-Toxic Lubricating Solution - 2 oz. Use this non-toxic, eco-friendly lubricant to tackle odd jobs like squeaky doors and rusty nuts and bolts—without any harsh fumes. It took makers Adam Stolpen and Bill Woodworth five years to perfect this spray, which doesn’t have any harsh chemicals, silicon, or volatile organic compounds. Dimensions (in packaging): 8.25" x 3.75" x 4.5"
So far it seems to be working great. The real appeal here is it’s all natural. Nexus Green is a Made in the USA, sustainable eco-friendly lubricant that tackles squeaky doors and rusty nuts and bolts with a non-toxic formula. 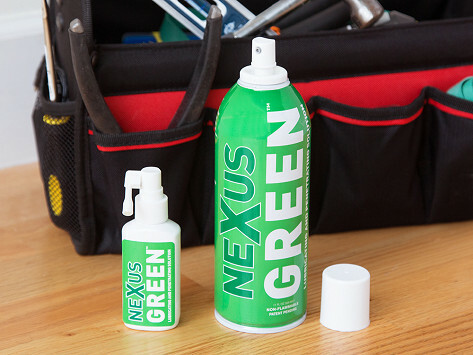 Nexus Green lubricates without any harsh chemicals, silicon, or volatile organic compounds. And, unlike other types of lubricants, it even works in the winter. Makers Adam Stolpen and Bill Woodworth spent five years perfecting this spray, so it would be gentle enough to use around the house, yet tough enough for heavy duty jobs. Their inspiration came when Bill’s son’s school had to close for 48 hours during routine locker maintenance to properly ventilate the fumes. Bill and Adam wanted to design a lubricant that would get the job done without being dangerous to be around. We also find it more empowering to do odd jobs around the house when you know the solution is safe (and easy) to use.